We Are Your #1 Source in the Tampa Bay Area. Welcome to Sunshine Screens of Tampa, your best choice for all of your pool enclosure repair needs. Whether it’s power washing, patching, or completely replacing pool screens, we specialize in a variety of pool screen repair services. As a pool screen repair company that has many years of industry experience, we know exactly what it means to take care of your home while we perform our work. From our initial meeting to our final goodbyes, you’ll pleasantly notice the Sunshine Screens of Tampa difference. If you’re in need of pool enclosure services, please call Sunshine Screens of Tampa, your number one pool screen repair company. We’d love to hear from you! The affordability you want with the customization you need. We offer specialized brands and options for patio and pool enclosures. Sunshine Screens also GUARANTEES 100% SATISFACTION on all of our works! This vinyl-laminated screen not only functions as a privacy screen but also keeps debris like small leaves and grass clippings from entering your pool area. Some customers like these panels installed in the lower section of the cage. Pet screen resists damage by pets and is made of strong vinyl coated polyester. We also have installed this screen as a heavy-duty agent to resist problem insect areas. It still offers good outward visibility for busy traffic and high puncture related areas of your screen enclosure. This screen is great for areas that needs excellent shading protection from the direct sunlight. The screen is made from vinyl-coated polyester fabric and is fully pliable and easy to spray clean. It can be face mounted to balconies, porches and screen enclosures. This screen offers good visibility and daytime privacy. In need of your next screen repair? 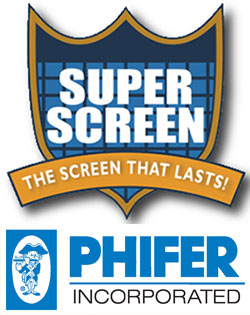 Sunshine Screens has been serving Hillsborough, Pasco & Pinellas Counties with a great service!